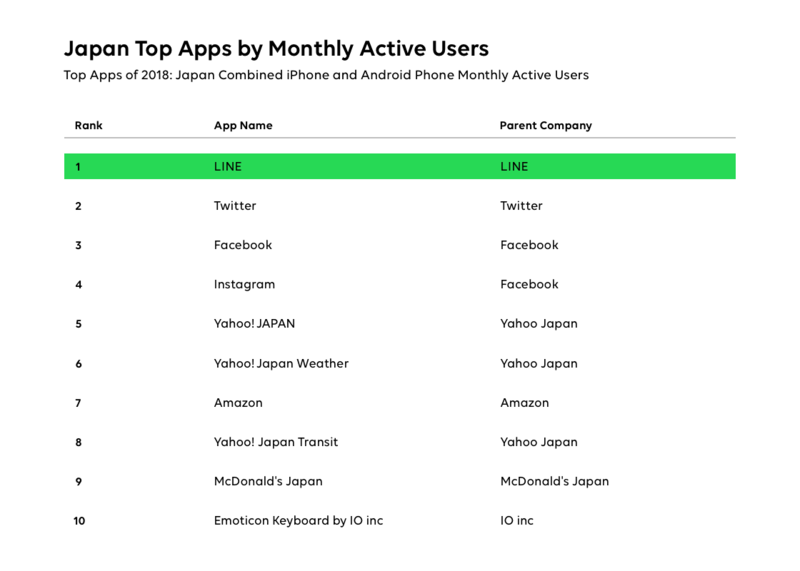 ●The LINE app also came first in the ranking for "Japan Top Apps by Monthly Active Users (Non-Game)"
TOKYO – February 26, 2019 – In the Top Publisher Awards 2018 recently released by App Annie, the LINE app ranked in at number one in the "Japan Top Apps by Consumer Spend (Non-Game)" category, followed by digital comic service LINE Manga in second place, and music streaming service LINE MUSIC in third place. The publisher of the ranking, App Annie, provides data and analytics tools for the mobile app market. 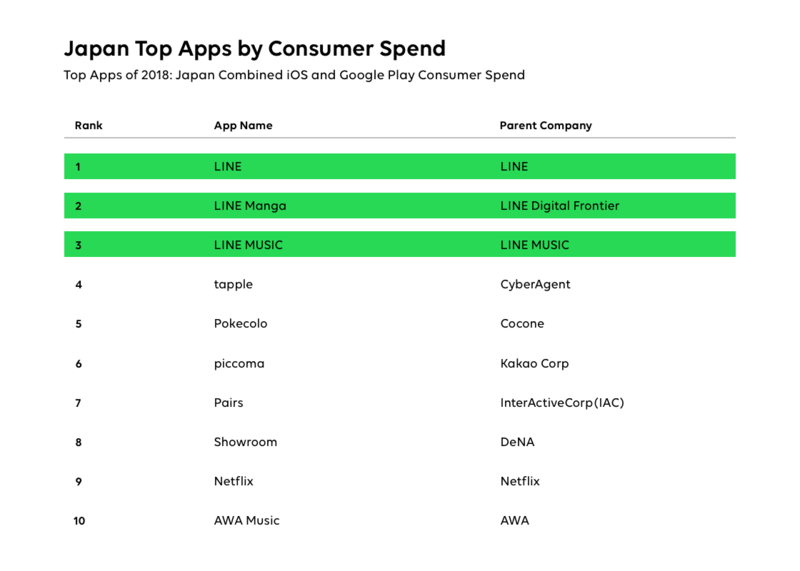 According to the ranking, LINE services dominate the top three spots for the highest-earning non-game apps in Japan, with the LINE messaging app coming in first, LINE Manga in second, and LINE MUSIC in third. This marks the second year running that the LINE app and LINE Manga have ranked in at first and second place respectively for this category. 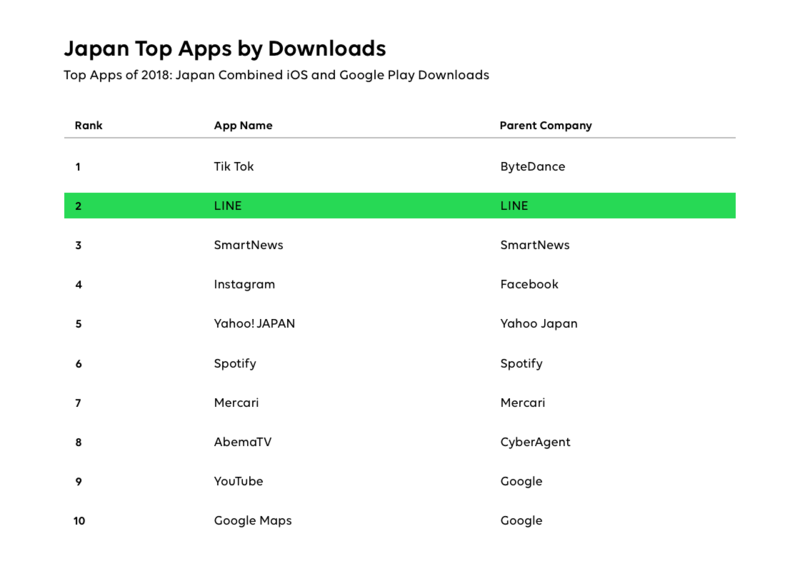 In other rankings, the LINE app also claimed first place in "Japan Top Apps by Monthly Active Users (Non-Game)," and second place in "Japan Top Apps by Downloads (Non-Game)." 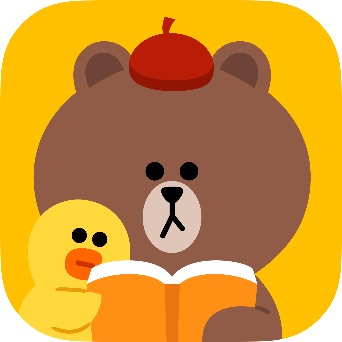 In rankings for the highest-earning publishers, LINE was ranked fourth among Japanese publishers, and tenth globally. For combined annual iPhone and Android non-game app revenue in Japan, LINE ranked first, with LINE Manga second, and LINE MUSIC third. 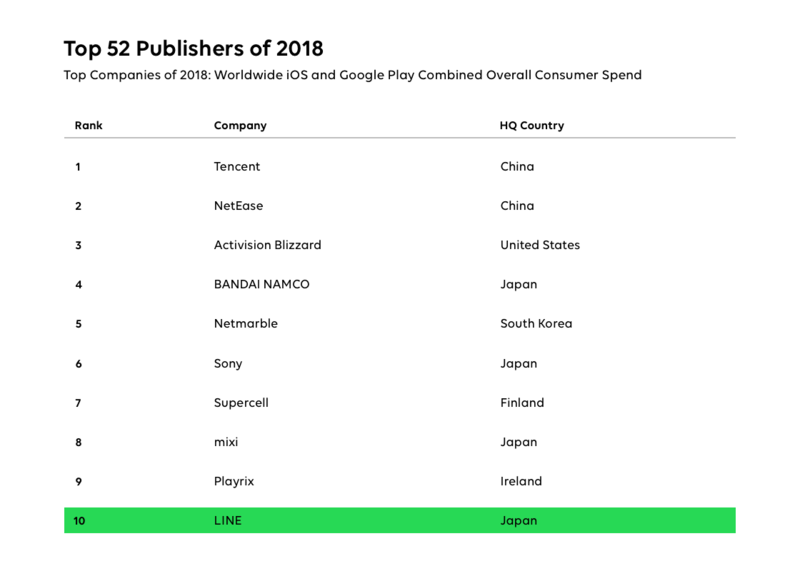 LINE ranked first for having the most monthly active users among all iPhone and Android non-game apps in Japan in 2018. 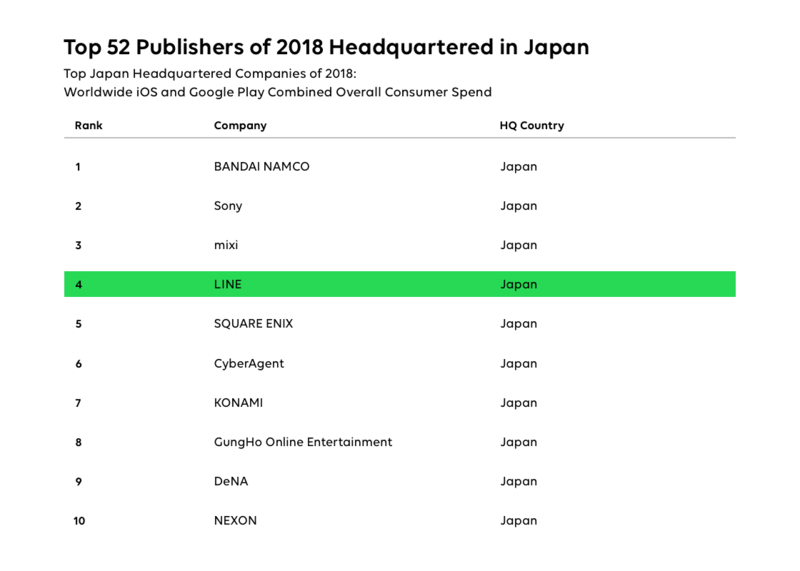 LINE was ranked as the second most downloaded app in 2018 out of all iOS and Google Play non-game apps in Japan. LINE ranked in as the fourth highest-earning publisher across iOS and Google Play. LINE ranked tenth out of the top 52 companies for worldwide combined iOS and Google Play app revenue. App Annie is the most trusted mobile data and analytics platform for the mobile app industry. Since 2010, it has been developing the market for mobile app data and supporting world-class mobile-first companies. Its mission is to assist companies in their mobile transformation and help clients provide the best possible consumer experience. Over 1,000 major clients covering all industries worldwide and over one million registered users are using it as the tried and true formula to revolutionize their mobile business. The company's headquarters are in San Francisco, with offices in 13 other cities across the globe. LINE offers "fun and free" voice, video, and chat communication between users, domestically, internationally, and across telecommunication providers. 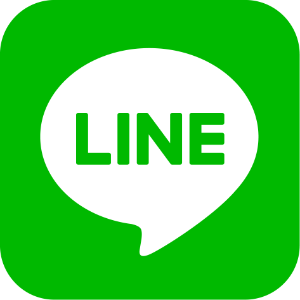 Since service launch in June 2011, LINE is now used in over 230 countries and regions around the world. LINE users can enjoy individual and group chats free of charge with the chat, voice call, or video call features. They can also send photos, videos, voice messages, location information, and music, as well as money through LINE Pay. LINE Manga is a digital comic service operated by LINE Digital Frontier Corporation. Allowing users to enjoy comics at any time on the LINE app, the service is celebrating its sixth year in 2019. Over 300,000 titles are offered on the digital comic store, which are made available through partnerships with more than 250 publishers and labels. Around 1,000 works are also offered by many publishers as a Free Series, with one volume being made available every 23 hours. As of June 2018, the app has been downloaded over 20 million times in Japan. 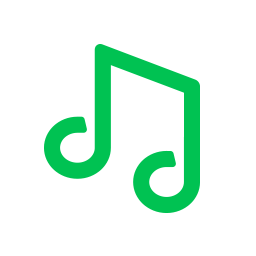 Operated by LINE MUSIC Corporation, LINE MUSIC is a music streaming service that gives users access to over 51 million Japanese and international songs from a wide range of genres to suit every mood and moment. Users can search for artists and songs, as well as listen to the latest charts and playlists. By linking with the LINE app, the service offers other popular features, such as allowing users to set their favorite song as the background music of their profile picture. To date, the app has been downloaded over 30 million times.